An important part of our Lenten Observance is almsgiving – the giving of alms to the poor. Today we can equate this with giving to charity, or fundraising. 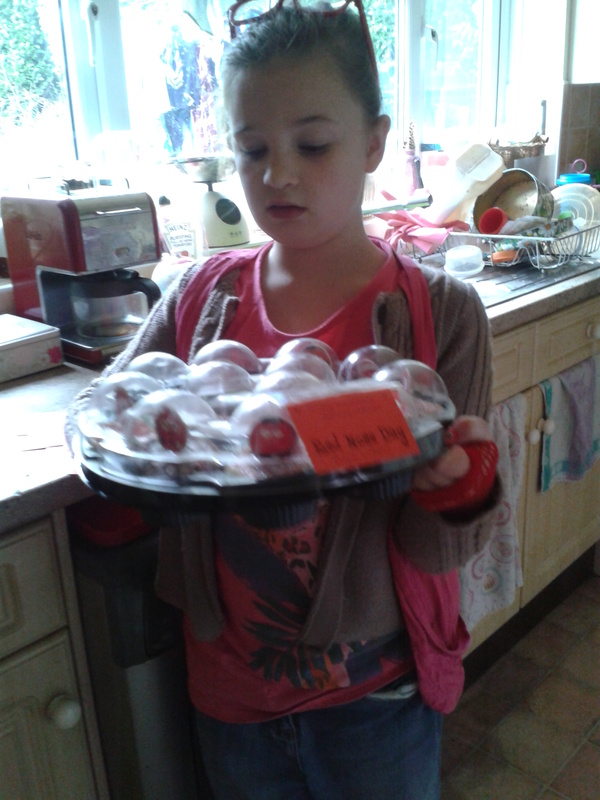 As Red Nose Day falls within Lent this year, our family decided to hold a bake sale to raise funds for Comic Relief. We have all really enjoyed watching The Great British Bake Off for Comic Relief, so feeling inspired, eldest daughter decided to bake rainbow cupcakes – however our natural food colourings created a more mottled effect which looked more like bogies! Rather fitting for Red Nose Day really! 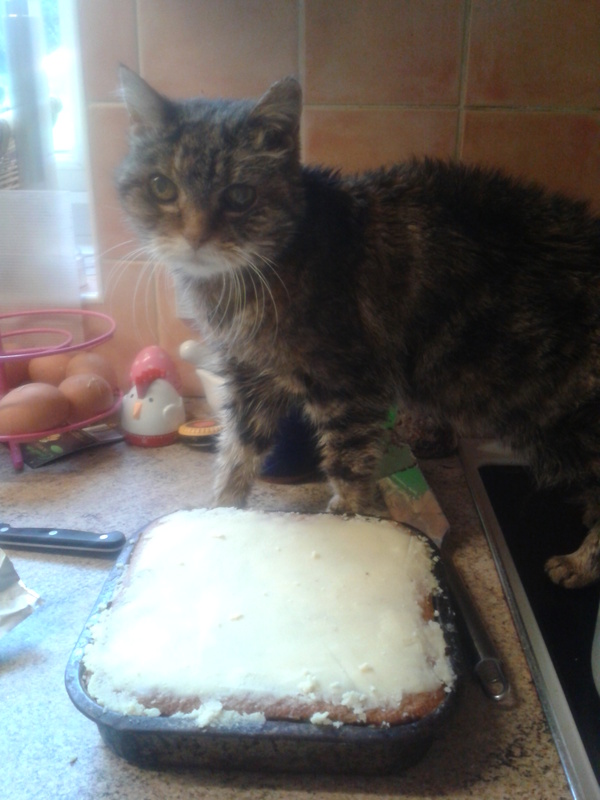 She also made some ‘yum yums’ – her own secret recipe. Youngest daughter played safe and baked some plain cupcakes and then decorated them beautifully. 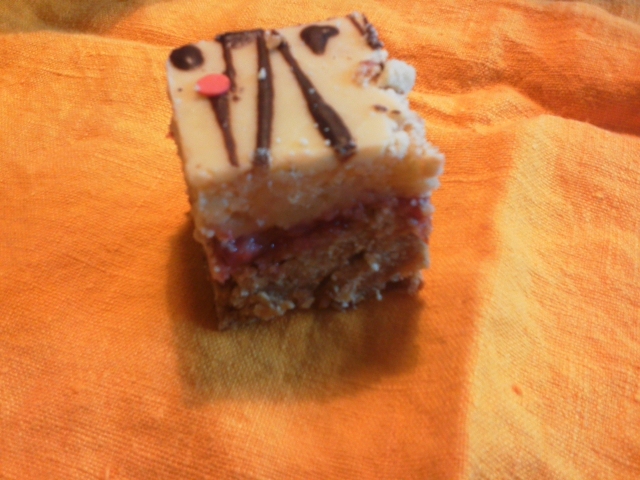 I took on the tray bake challenge and this is what I came up with! There are several layers to this tray bake – at the bottom is a layer of flapjack. I am not ready to share my recipe for flapjack as this has become my signature bake, so you will have to find your own recipe! I used half of the cupcake mix from youngest daughter’s bake. 2. Make your flapjack mix and bake for half the normal time. 3. 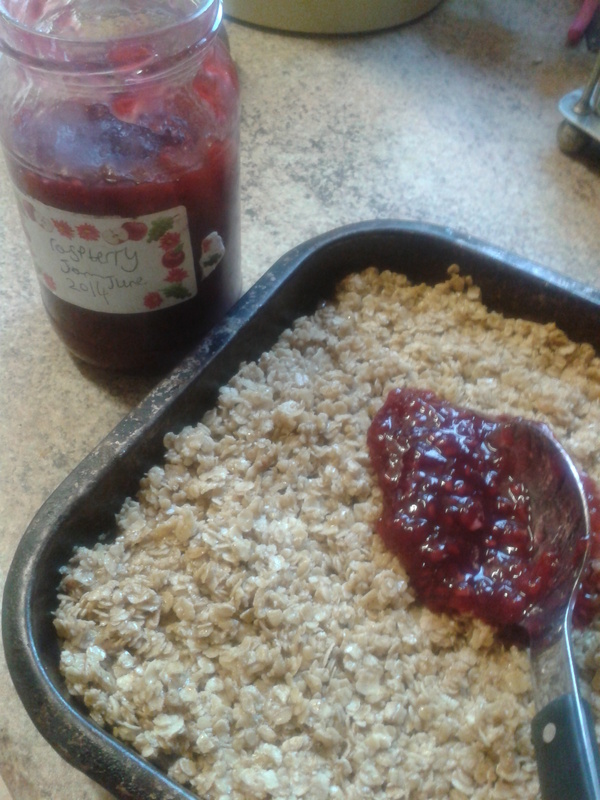 Spread a layer of your favourite jam on top of the flapjack mix, then top with the sponge mix. 4.Return to oven and bake until a beautiful golden colour, the mixture sings and the sponge springs back when you press down on it lightly. Or do the skewer test. 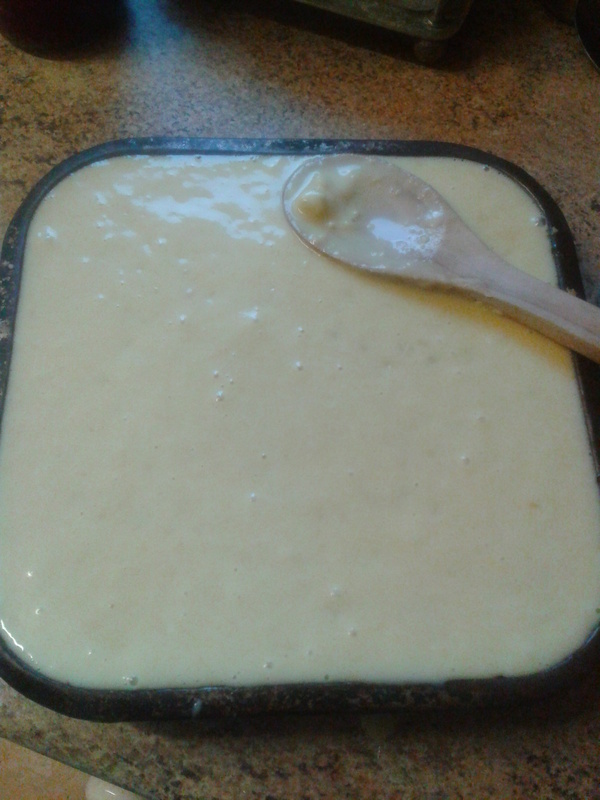 If the cake looks cooked but the skewer comes out gunky, return to oven with a protective tin foil covering. 5. Leave in tray to cool. 6. Melt a dollop of butter in a saucepan add a couple of handfuls of milk chocolate until melted (or soft enough to spread). 7. 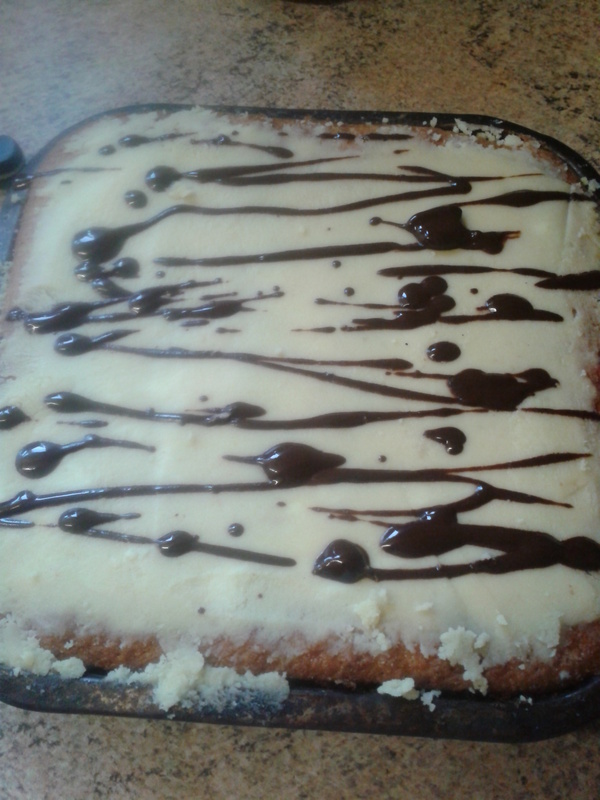 Spread over the tray bake, then repeat the melting technique with the dark chocolate and another dollop of butter. Drizzle this over the traybake. 8. Strategically place the red dots over the chocolate toppings. 9. When all has set and cooled, slice up and sell, sell, sell. 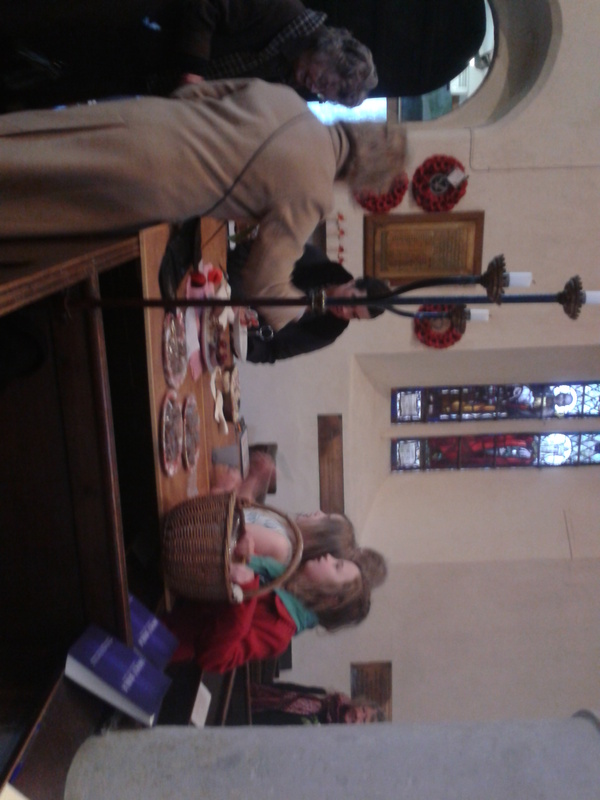 We took the cakes to church on Mothering Sunday, along with a mini Simnel Cake and the girls were instructed to sell for as much as they could! A grand total of £73.33 was raised, and as it was Refreshment Sunday, there was no guilt at tucking into these cakes for tea!